bleeping constantly. At first I found it quite amusing, but then when the statements made between a few anglers started to become quite personal and I watched how these anglers so easily fell out realized just how ugly, horrid and damaging social media can be. Now you know why I don’t reply to comments! Something that sent shivers down my spine this month was when I saw the location pinpointed on a map in Anglers Mail (Oct4th) where an angler was murdered on the Thames. It’s the exact spot where I have fished on a few occasions and have to say have never felt that comfortable when doing so. It’s also a location I introduce one of my customers to and he also felt unsettled there as to fish the swim you find yourself sitting right under the roaring water falling over the weir. Your back is to the path that leads to the swim and there is no way you would hear anyone creeping up on you. On more than one occasion we have witnessed strange characters, probably people taking fish for the table, hanging around and although the fishing, at times, can be very good, you never really relax as you find yourself constantly looking behind. To fish this island you have to be in procession of a Thames Weir Permit, something that 95% of the anglers there haven’t got. I have only ever been checked once and after speaking to the lock keeper realise how difficult it is for him to keep an eye on who fishes as access is across a narrow bridge upstream of the lock. Personally I think this attack could have been avoided simply by making access across the bridge by key only, something that wouldn’t be that difficult in impose. I have to admit I stopped buying a Thames Weir Permit, although it was only around £25 and gave access to some fantastic venue’s, simply because it seemed that everyone else fishing there didn’t have one. Don’t get me wrong, I don’t fish these areas anymore but would quite happily fork out twice the yearly permit price if I knew these areas were only accessible by key holders, something that would make me feel far safer. I’ve just read Colin Davidson’s weekly post in Anglers Mail (Oct 4th) about the situation surrounding the capture of ‘Big Rig’ the biggest UK carp by Tom Doherty and have to say I agree with everything he says. For crying out loud, when a club or fishery buys carp from a fish farm then they are buying carp that in most cases have been bred and reared to a certain weight, be it 20lb or 40lb. They can be bought at different weights, even handpicked if needed and are then placed in a lake where anglers can fish for them. So I cannot see the difference if a fishery wants to do the same and bring on a few individual carp to even bigger weights than a fish farm can affordably do and then release this for anglers to fish for. I know to some extent what Tom is probably going through right now as a few years ago I caught a fish that should represent my best ever fish, a 3lb 15oz roach, however it’s a fish, to some degree I wish I’d never caught, as the green eyed monsters were out in force making what should have been a period of celebration, far from it. So if you’re reading this Tom try and block out all the crap however difficult it is and try and enjoy the capture as in my mind it should go down in angling history. On the same note I know of a couple of well known anglers that acquired a piece of river and were hand feeding barbel in the hope of achieving huge weights, maybe breaking the British record. These fish were introduced to the river illegally, not by them and at quite a high average weight. I’m not sure exactly what happened but I’m guessing that these fish slowly died due to old age before making history making weights, yet I bet that if they had grown these to say 22lb, caught by rod and line and then made a record claim they would have been accepted. Whether we like it or not, if a fish is of a record breaking weight and is caught fairly on rod and line then this should be recorded as part of our countries history. On a different note I had to smile when a quick experiment by a friend between the two weekly magazines went as Id told him it would. 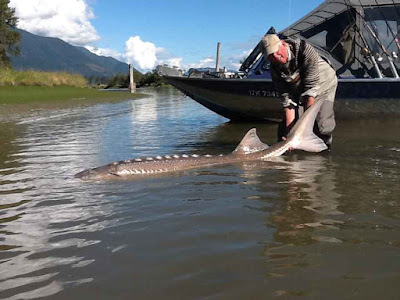 On capture of a very big fish, just a few ounces of the British Record, he decided to submit this to them both in the hope of gaining a weekly award (this fish should have been awarded by both). I had already explained to him that if you’re not....I’m not mentioning any names here.....then don’t expect an award from one of them and true to form it went as expected. The other magazine rewarded him on merit of capture, irrespective of who he was, so if you’re an angler and you catch a big fish, then think twice where you send it. The choice is yours? Unfortunately I’m not going to specify the exact amount of hours that I have found myself angling for myself this month as it’s quite depressing, however any month that see’s a 4lb plus crucian and a 2lb plus roach landed has to be looked on as somewhat of a result. On the upside to this month the amount of time spent on the bank with other anglers creating features for Anglers Mail has been well up, so things are good in the freelance world. These features often involve travelling, sometimes two-hours plus each way, so when you realise that I then spend up to six hours with the angler as well as spending quite a few hours, usually the following day, manipulating images and writing the words start to understand why angling for myself can be limited. Don’t get me wrong, I’m not complaining as I love this type of work as not only do I get to meet some very good anglers, I also get to find out about new venues, often ones that are producing big fish, however, even if I did get time, jumping into someone else’s swim after they have done all the hard work isn’t something I’d feel happy about. I have to admit to be somewhat jealous of my friend Lewis who recently headed to Canada and enjoyed a week catching loads of fish including this near 300lb sturgeon! Thankfully November see’s lots of game stretches of river opening their doors to grayling fishing and tomorrow will see me long trotting a stick float down a chalk stream in hope of a two pound grayling or better still a three! I’m really looking forward to this as it’s been a while since I got the centrepin and float out and walking for miles, rarely seeing another angler and occasionally seeing the rod bending double as a fish races downstream, for me is the ultimate angling experience. Sadly everything just written can’t be associated with barbel fishing on my local rivers anymore, which is a shame as so many anglers seem to be interested in this species. Fortunately I have an idea, one that I will be acting on very soon and although this may mean travelling further afield, I do believe that I can continue to guide for barbel with a high degree of success when it comes to seeing my customer catch. No it won’t be on the Loddon or Kennet, but a river open to all, and if for some reason a barbel doesn’t show then I reckon that I can still deliver an enjoyable, educational day out which will see lots of fish landed! Will keep you informed! slowed for three hours, so I used the right hand rod to try and find the fish by casting around and soon after a rig and bait changed caught another crucian this time 3lb 13oz followed by one of 3lb 8oz along with the odd modest rudd. Not a bad session, eight crucians all over 3lb and another thought provoking session as just when you think one rig is the best another works, proof you should never stop changing things, especially when a swim dies. 03/10/16 – Spent the morning roving around the River Blackwater with local angler Alan Muller to produce a feature for Anglers Mail, before returning to the office and writing it up. 06/10/16 – After a couple of days in the office it was good to get back out, this time on the river Loddon Guiding a customer. Unfortunately the easterly wind did little to boost our confidence however we tried, oh boy did we try. In fact we covered more than twenty swims, dropping a bait in each in the hope that a barbel or two would show, however apart from three chub bites which were all missed it was just one of those days when effort certainly doesn’t equal reward. My customer Matt wasn’t disappointed as he learnt everything there is to know about this stretch of river, what works (well, when they are feeding) and is looking forward to a return trip with me where we will leap frog each other down the river until we get a response. 07/10/16 – A sort of lay-in today as I didn’t have to be on the river till 9am. This time it was to meet up with a lure angler to produce a Lure Attacks feature for the Mail. The weather was good, the fish responded and come late afternoon and after visiting two different venues I had everything I needed. 08/10/16 – A day in the office writing up the AM feature along with loads of other things. 10/10/16 – On the road come 9am, this time to visit Andy Lush at ‘The Friendly Fisherman’ in Tunbridge Wells. Luckily I missed the traffic both ways and even had time to manipulate the images before picking the girlfriend up. 11/10/16 – On the road come 6.30am, this time to produce a river carp feature for Anglers Mail. Fortunately the angler knew his venue well and banked a number of fish and come 11.30am I was back on the road. 13/10/16 – Certainly clocking the miles up this week as today I was once again on the road come 6am, this time heading to the Lea Navigation to team up with Joe Royffe to do an Anglers Mail article. After 4hrs driving and 6hrs on the bank I didn’t quite feel like writing the words to go for this that evening, god knows when I will be able to get on top of things? 14/10/16 – Spent most of the day writing the words to go with the AM Lure Attacks feature done on Monday before grabbing a bit of kit and heading to Frensham to see if the rudd were feeding? 15/10/16 – Tried to give the lady as much time as I could but come the afternoon had to creep away to the office and get the words done for the feature done on Thursday on the Lea Navigation. Getting there slowly but I still have the words for two features pending. Will get there finally! 16/10/16 – Spent the morning on a busy river Loddon to catch up with a friend. Unfortunately it wasn’t a very social start due to the weather but once the rain stopped things became a bit more bearable. Mark managed one 4lb chub but would have proffered a barbel and I fished for perch, however all I caught was two small jack pike. 17/10/16 – A day spent between two venues, the first was to try and catch my customer a bream to beat his best of 8lb 8oz and the second was spent perfecting his casting. Unfortunately the overcast morning was replaced with cloudless blue skies, yet this made casting in the afternoon easy and come the end of the day Ross had certainly honed in some new skills and can certainly cast quite a few yards further. 18/10/16 – Spent the day in the office completing the AM features started last week as well as sorting the barbel kit out for an early start tomorrow. 19/10/16 – On the bank and fishing at 7.30am but come 11.30am and with no signs along with the sun up decided the best time had passed so headed back to the office to finish up writing features. Back on top of things at last but can’t get out for the next two days as have other things planned including taking my mum for a game of golf as it’s her 80th birthday on Friday. 22/10/16 – Met up with my good friend Jake Lund in the morning on a local lake to take a few images for his next Carp Crew feature in AM before sorting the kit for my first night under the stars for ages this coming Monday. 24/10/16 – 25/10/16 – Need to get out more as after last night’s events there are certainly plenty of fish to be caught. Arrived at the lake at 6pm and fished through to 9am with the hope of a two-pound roach, which fortunately graced my net at around 3.30am along with ten or more others including a 1lb 12oz and 1lb 14oz fish, a dozen rudd, one gudgeon, a single common carp and three tench to over 7lb. Certainly an eventful and rewarding night with very little sleep and an interesting one as needed to keep changing things to get the right approach. I’m going to write an Anglers Mail blog on this session so keep your eyes peeled as it will show just how important it is to keep altering things to get it right. 26/10/16 – With it being so mild and with as the wind is on the swing to the S/W thought I’d have one last go (it seems there has been quite a few of these recently) at the crucians at Enton. Having the lake almost to myself took a risk and dropped into a swim in the shallow water, fished for four hours and managed three tench, all around 6lb, but no crucians. Back at home come midday to sort out the barbel kit for a day’s guiding tomorrow before sorting out an Anglers Mail blog on the nights roach fishing that fortunately, with a few tweaks, can be doubled up for a European magazine. 27/10/16 – I have to admit that when John requested a day’s barbel tuition on the river Loddon I had to reinforce the fact that catching wasn’t something that I could guarantee. Now you may think that no one guarantees catching, but you would be surprised how many angler expect to catch. Unfortunately the odds of consistently catching a barbel nowadays on the Loddon in a few daylight hours is something of the past, yet it something that I need to look at and have an idea up my sleeve. Although I’m always confident that the three-foot twitch will come, when the day ends and just a few chub bites are forthcoming then I’m not that surprised. Today was one of those days when although a small chub did grace John’s net, the two that somehow shed the hook would have made the day quite special, but for me John wanted to catch his first barbel and the Loddon just didn’t produce. Time to leave the Loddon alone and head to pastures new, something I have been saying for a few years now! 28/10/16 – With the weather so mild I felt I needed to get my dad out again so come 7am we were setting up in a couple of our favourite swims at Enton. Everything looked and felt spot on but just like all the other anglers that also had the same feeling, the fish had other ideas. Six hours later we decided to throw the towel in and accept a rare blank on this productive venue. 29/10/16 and 30/10/16 – Two days full on in the office writing articles for European magazines and Anglers Mail blog page as well as sorting the grayling kit out and getting on top of the tackle shed that has gone somewhat untouched for a few months. There’s over 100 pages to enjoy so take time to have a look, its a great read. After my previous video shot at Frensham Great Pond by Carl and Alex at Nash HQ which saw more than 20'000 hits recorded I have been back out on the bank, this time with my good friend Tom Aldous on the banks of the river Loddon in search of a barbel. The video was shot and produced in just a few hours as opposed to the countless hours needed to create the Frensham one but hopefully you will find it entertaining. Predator season under way and the zander are on the feed! Guiding for zander at Old Bury Hill. If you fancy being guided for zander at Old Bury Hill then now is the time. The next six weeks will be best, before the cold weather arrives, however availability is tight so if you don't want to be disappointed its worth getting in touch now. The best way is to email me at duncancharman@me.com and I will forward some dates along with a full breakdown of cost and what's included.